Happy day! I hope y’all have started your week off with some energy, joy, and goal setting! 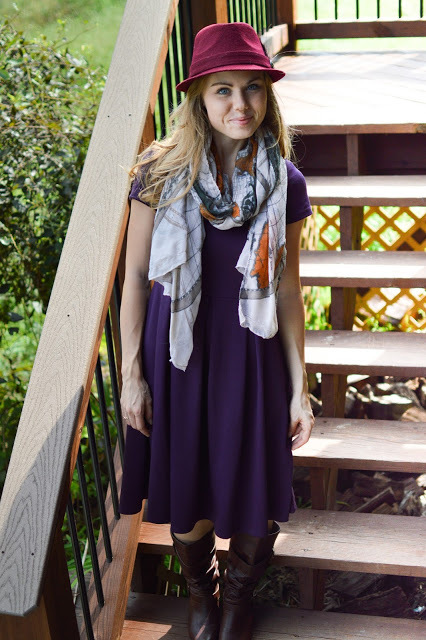 Mikarose was kind enough to send me their Ivy Dress in Eggplant to review. I recently realized that I love wearing dark purple because it works for so many seasons and occasions. This dress is well made, flattering, and cut in a way that it’s not too tight, yet not too loose. The wide pleated skirt style is timeless and on trend right now. I love that the Ivy Dress has no zippers or buttons– just toss it on and go! No tanks to layer, no slips necessary. Mikarose has a ton of gorgeous dresses. I didn’t realize how “fallish” this outfit is until blogging it, ha! As I try to build a smaller wardrobe, this dress is gonna be a keeper. It’s just so simple and easy. Y’all have a wonderful week! Do you have a favorite dress silhouette? This outfit is perfection! Love the color of the dress and the scarf is amazing. You said it came from Amazon, but do you have a link? I'd love to have one of my own. Been reading your blog for years, and I've always loved it. I have printed green maxi dress I got from eShakti that I have almost worn to death. It's light and flowy, so it's great for spring and summer, but the pattern and color also work for fall, so all I need to do is throw a denim jacket on over it. I cried a little when I paid for it, but I definitely think I got my money's worth. Incidentally, at knee-length, this dress is a little bit short for my taste so I am looking into adding a little length (2-3") in a black fabric… without the work of cutting out a new skirt and then hemming it. Ideas, anyone? I love checking in on your blog, Olivia! Hope you are feeling better today. Thanks for your suggestions! I thought about adding fabric, but I was told that it would be necessary to cut it in a circle in order for it to sit properly (not to mention having to hem it perfectly). Is that true? I'm scared to attempt cutting out a circle. Nope, you don’t need to cut it a circle(: All you have to do is cut a piece of fabric as long as the width of your dress plus an extra in or so for seam allowance. Sew it onto your dress starting at the seam so once you gone all the way around you’ll end up with two unfinished edges, pin those together to the inside and sew it up. That way it will look like the seam of your dress all the way down. OR if you want an even easier version you can just cut a piece of fabric twice as wide as you want to add on and iron it in half. Then sew it on the same way as the other one(: I really like this way because it gives a neat, finished edge but it doesn’t work as well with thicker fabrics.. I’m not the best at explaining so this probably sounds all confusing but it’s actually very simple especially after you’ve done it a few times. Your pointers are greatly appreciated! Lengthening my dress seemed so intimidating before that I was beginning to consider buying one of those expensive dress extenders (i.e. fancy slips designed to show), but I think making something myself will best fit my situation. I love your dress! It is so cute. The fedora is awesome too. When is the next Awk/Awe coming out? This dress is quite pretty and it /is/ a great color! I like your hat too – so cute and classy. 🙂 Fit and flare is my favorite dress silhouette! That dress is so pretty! I think I look best in dark purples, I just don't wear it that much because I don't have very many clothing items that color. I love this dress looks great on you. That color is my favorite! I'll have to check it out! Olivia, I love this dress! The color really looks good on you.! 🙂 Is this company normally expensive like other normal companies? (by expensive I mean like over $20 per item not on sale) Thanks for the post! I can't wait for fall. I can see why you like it-very pretty. I have to say, I love it with just the belt, simple seems to be my style. Through "Dressing Your Truth," I've figured out my personal style-simple! It's refreshing and easy now to shop-and I spend less on clothes. Before I was buying a TON of stuff I never wore after purchasing. I realized today I haven been on your blog on ages, what?! Sheesh, life gets busy and you don't even know it. How are you feeling by the way? I splurged on a Mikarose dress for my wedding luncheon years ago, and it's still my favorite thing in my closet! Their clothes fit amazing and have such a classic look that you can wear them for years (good, because I need to get my money's worth!). This is a really cute dress. I love purple; it is my favorite color. I would consider getting this dress, but I am not quite sure about the sleeve. I would like it just a little bit longer. Absolutely love everything about this outfit! All those colors are some of my favorites! Well, aren't you a doll! I came over on Mama Moments, and I'm glad to find your post. 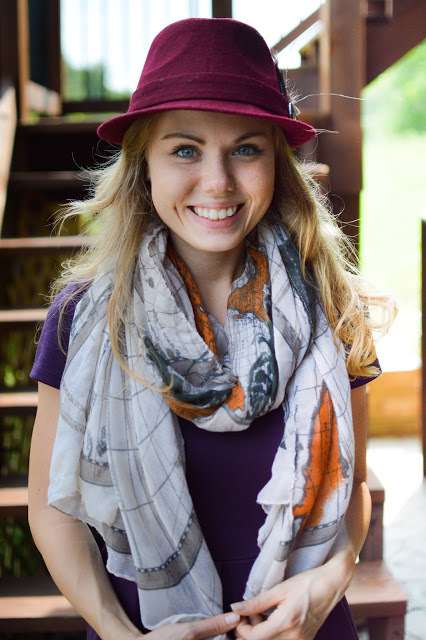 Love your outfit and your desire to encourage other young women to honor the Lord. I pray that God will grow your ministry and use you in a mighty way! Olivia…I like your outfit. I love dresses and yours is really pretty. The color is gorgeous. Thank you for sharing at Monday's Musings. Grace & Peace.